Many visitors to Jerusalem follow in the footsteps of Christ walking the Via Dolorosa in the Old City. It was this route that Jesus took in his final hours before his crucifixion. The route leads from the Lion’s Gate (site of the former Antonia Fortress), where Jesus was judged and sentenced to the Church of the Holy Sepulchre where Christ was crucified at Calvary and entombed. Along the 600 meter route through the Old City there are 14 Stations of the Cross where Jesus stopped or paused for some reason as he carried his cross on his back through the crowds of onlookers. The Via Dolorosa is the site of several churches which commemorate the events of Christ’s Passion. The churches were established after the 4th century when Constantine made Christianity legal and pilgrims began following the Via Dolorosa. The route changed over the years but by the 16th century the Via Dolorosa we know today had been firmly established along the route of the original Byzantine pilgrims. 300 meters passed the Lion’s Gate the 1st Station now lays within a Muslim school across the road from the 2nd Station. The Notre Dame de Sion Ecce Homo is nearby. The Flagellation Church and Condemnation Church (Chapel of Judgment) are both within the Franciscan Monastery compound. At the second station Jesus received his cross. The Flagellation Church is known for its stained glass windows depicting Pontius Pilate washing his hands of sin; Jesus receiving a crown of thorns and of Barabbas, a prison released instead of Jesus. In the Church of Condemnation the wall behind the altar bears a painting of Jesus receiving his cross. The Convent of the Sisters of Zion is not far from here and contains parts of the Pavement of Justice or Lithostratos, Roman era paving. Here a small 15th century chapel was built by the Armenian Catholic Church. It is sometimes referred to as the Polish church because it was renovated in 1947-48 with funds from the Polish army. Above the entrance of the church is a stone relief depicting Christ fallen as he carried his cross on his back. The same image can be seen on the wall behind the church altar. From the church you can descend down a short flight of stairs to the chapel of the third station in the crypt. The Armenian Church of Our Lady of the Spasm is close to the 4th station. Here Jesus is said to have seen his mother Mary in the crowd. Inside the church is a 5th century floor mosaic and inprints on the floor believed to be Mary’s sandals. The church at this station is the Franciscan Church of Simon the Cyrenian (Cyrenia was located where Libya is today). Simon was pulled from the crowd by the Roman soldiers and ordered to help Jesus bear his cross. The chapel was built in 1229 and is believed to have been the first chapel established by the Franciscans in Jerusalem. Here Veronica stepped forward and wiped the sweat and blood from Jesus’ brow. An image of Jesus’ face was left on the cloth which became a holy item referred to as The Holy Face, Veronica or Sudarium. The Greek Catholic Church of the Holy Face marks this event. The church is run by the Little Sisters of Jesus. The church is an elongated room with an arched Crusader ceiling. It is a cave-like chamber with exposed stone on all walls. There is a small doorway leading to the crypt on a lower level. The church was visited by Pope Paul VI in 1964. This chapel was refurbished by Barluzzi in 1953. At this busy intersection of the ancient and modern Old City Jesus faltered under the weight of his cross as the Via Dolorosa began an upward incline. At this station ornate doors give entrance to a flight of stairs leading to a lower level where there is a Franciscan chapel. This chapel is closed to the public but was first established in 1875. Above the altar is a picture of Jesus falling; it is framed in ornate, gold decoration. A fresco beneath the altar shows Jesus fallen. To the right of the entrance are steps leading down to a second chapel, the Chapel of the Seventh Station where there are the remains of a 2nd century column. The exposed stone brick walls and arched vault ceiling add to the beauty of this chapel. Above the altar is a relief sculpture of Christ falling with his cross. At this station Jesus spoke to the women in the crowd who were weeping; he told them to weep not for him but for themselves and their children. The Greek Orthodox Church of St. Charalampos and monastery at the 8th station is dedicated to Saint Charalampos. There is also a German Hospice close to the 8th station. This station is in a rooftop courtyard adjacent to the Church of the Holy Sepulchre and is marked by an ancient pillar embedded in the wall of the Coptic Patriarchate (Egyptian Christians). Adjacent is the Coptic Orthodox Church of St. Anthony. From the 9th station you can see the cupola of the underground Chapel of St. Helen. The chapel is also the site of an ancient underground cistern accessed via a short flight of stairs. The underground cistern provided water to the Church of the Holy Sepulchre. Near the 9th Station, on the roof of the Chapel of St. Helen is the Ethiopian Church of St. Michael which is adorned with colorful pictures of King Solomon meeting the Queen of Sheba. Station X – Jesus is stripped of his clothes; Station XI – Jesus nailed to the cross; Station XII – Jesus is crucified at Calvary; Station XIII – Jesus is taken down off the cross and Station IXV – Jesus’ tomb. These Stations of the Cross are all within the Church of the Holy Sepulchre. This is the most important Christian church in Israel; it contains many chapels and important religious artwork. The church is shared by several denominations. On entering the church the stairs to the right lead up to Calvary (Golgotha) where Jesus was crucified. On the right is a window looking into the Chapel of Franks where the 10th Station X is located. Here Jesus was stripped of his clothing. Also at Calvary is the ornate Greek Orthodox Chapel of the Crucifixion marking the 12th Station. The Holy cross is believed to have stood on the area marked with a silver disk beneath the altar. Also at Calvary is the Catholic Chapel of the Nailing to the Cross which has a rare 12th century ceiling mosaic and holds the 11th Station. Between these two chapels is the 12th Station marked by the Catholic Our lady of Sorrow altar. After being removed from the cross Jesus was laid out on a slab of stone and prepared for burial. This slab of stone is the Stone of Anointing which is at the entrance to the Church of the Holy Sepulchre. 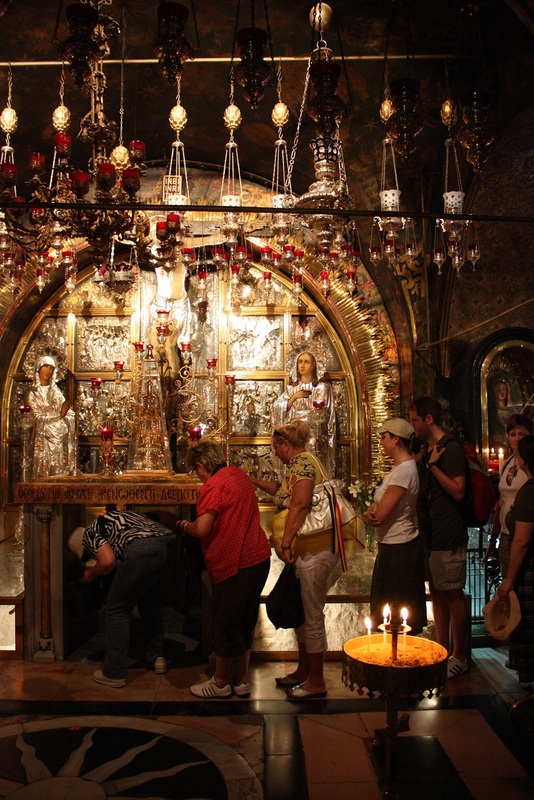 The final station is Jesus’ tomb which is now located in the Church of the Holy Sepulchre’s Rotunda, a round hall. Christ’s tomb at the center of the Rotunda is within a stone aedicule. The outer chamber holds the Chapel of the Angel where there is a piece of the original rock rolled in front of Jesus tomb to block the entrance. Further into the aedicule is the Tomb Chamber; a smaller tomb believed to have been where Jesus was laid to rest and later resurrected.